As part of a temporary art installation, park benches are being replaced by stoops in Philadelphia's Washington Square, Thursday, Sept. 14, 2017. It is nearly impossible to pass through many Philadelphia neighborhoods during the warmer months without seeing people sitting on the stoops to their homes. Stoops – the stone steps leading from the sidewalk to the front door of a house – offer residents a place to enjoy the weather, catch up with neighbors or simply pass the time. It's a timeless tradition embedded into the fabric of the city. And for the next nine weeks, the stoop will be celebrated at a Philly park. 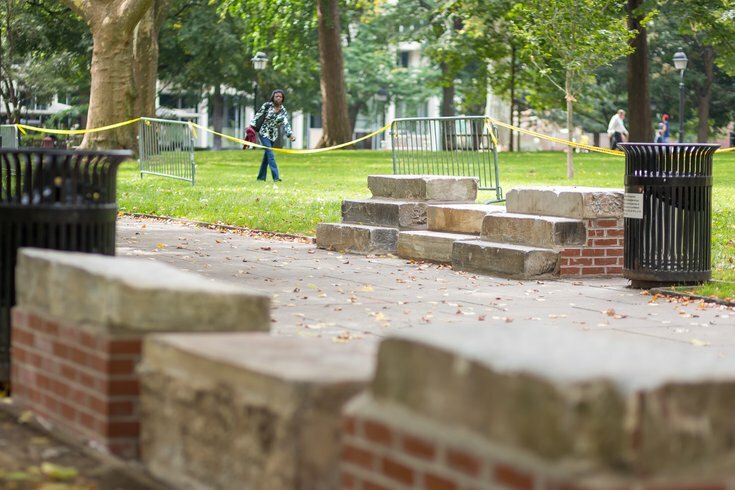 Beginning Saturday, Philly residents and visitors will be able to sit on 12 stoops in Washington Square thanks to a temporary art installation that salvaged the staircases from recently demolished buildings. The stoops – also known simply as steps in some city neighborhoods – will replace the park benches on the historic square's east side through Nov. 19. The installation is among 20 projects being featured throughout Philadelphia via Monument Lab, an art and history project produced by the city's Mural Arts program. Monument Lab asked artists to consider what an appropriate monument in Philadelphia looks like today. "I would like people to approach these objects and to feel that they can spend time with them – that is what is monumental," artist Kaitlin Pomerantz said of her stoops installation. "The monument is not so much the stoop. The stoop is the pedestal for the monument, which is the sitting, the thinking, the engagement." To create the installation, dubbed "On the Threshold," Pomerantz collected marble, concrete and brick from demolished homes across the city. The Bricklayers and Allied Craftworkers Local 1 then reconstructed the stoops using traditional masonry techniques. Kaitlin Pomerantz remembers sitting on stoops as a child growing up in Lower Manhattan. She found a similar 'stoop culture' when she moved to Philadelphia nearly 10 years ago. Pomerantz said her work invites visitors to remember the history of Washington Square – initially a potter's field where thousands of Revolutionary War soldiers and Yellow Fever victims were buried. "The idea of a space that was used for public burials, a community space where the bones of these lives are still resting – I see a parallel between that and all the discarded materials from these homes that contained all of these stories," Pomerantz said. "We're just throwing a lot of that into the waste stream and not taking precaution to protect it or reuse it responsibly." Pomerantz also envisions visitors considering the architectural features being lost as many Philadelphia neighborhoods experience development spurts. As a child growing up in Lower Manhattan, Pomerantz said, she and her friends often sat outside of people's stoops. But as real estate prices increased, that culture slowly eroded. "Philadelphia seemed, to me, the type of place where that type of community culture was still thriving," Pomerantz said. 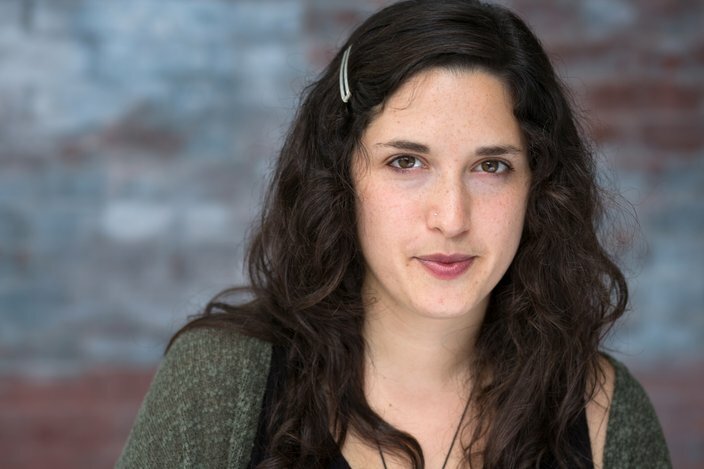 When she sees older Philly homes being replaced by new buildings without stoops, Pomerantz questions how that will impact the neighborhood's culture. Stoops serve as a threshold between the public and private space, she said. "A stoop is literally this relic of a type of home that is disappearing," Pomerantz said. "I wanted to give people a chance to physically engage with this piece of architecture and reflect on their own experience of it." Pomerantz also launched an Instagram account, @stoop_phenomena_, where she documented stoops from across the city. The Monument Lab projects each are located within 10 parks throughout the city, including all five of the original public squares drawn up by Philadelphia founder William Penn. In addition to Pomerantz' installation, Washington Square also features "Sweet Chariot: The Long Journey to Freedom Through Time," an interactive scavenger hunt developed by Marisa Williamson. The scavenger hunt highlights African-American history in and around Washington Square. Monument Lab also includes more than 20 events located in the communities around the art installations, including so-called "learning labs" where the public is invited to discuss the installations and describe their own visions for monuments in Philadelphia. While Pomerantz's invites the public to share their own stoop stories at a culminating event held at the Society Hill park on Nov. 4 from 1 to 4 p.m.
"I've already had a few really beautiful moments with visitors," Pomerantz said. "One guy came up and said, 'This feels just like home.' Another woman came up and said, 'I'm from South Philly – You have my approval.'"